During your last semester of college, or soon after graduation, you will likely begin applying to jobs in your field. New graduates face an extremely competitive job market, so every accomplishment and professional experience should be used to a candidate’s advantage. Since your résumé will be the first impression you give a potential employer, you should ensure that it is professional, easy to read, and that it fully highlights your accomplishments and potential for success at your desired job. Prompt offers numerous techniques to give your résumé an edge over the competition. Read on to understand the strategies behind an effective résumé. What Do Résumé Readers Look For? Most readers will be able to tell within thirty seconds if your résumé is worth their time. At most, they will spend two minutes on a résumé if they decide that you are a promising candidate. Therefore, all résumés should follow these guidelines: they should be clearly formatted, follow a conventional structure, include only relevant information, and make the most of limited space. Choose an easy-to-read, sans serif font, such as Times New Roman, Helvetica, or Ariel, in a readable size (between 10-12 point). Since your résumé should typically not exceed two pages, choose a font that will maximize your use of space while also being readable. You can vary font size depending on your section headings: for example, headings such as ‘Education’ and ‘Experience’ could be in 12-point font, while the content below can be in 10.5-11.5 to allow you the most space to describe your accomplishments. While you should include all relevant experience, a crowded résumé will cause a reader’s eyes to glaze over. Use white space to your advantage when you can, and use standard margins. For more vertical space, you might make the vertical margins three quarters of an inch. Half inch or three quarter inch margins on all sides are also options, as well as half-inch vertical margins with three quarter-inch horizontal margins. Spacing between lines should be no more than 15 point and no less than 6 point. Generally, the best options are between 9 and 12 point. There are two solid formats that we recommend people use to write their résumés: the Timeline and Regular formats. Résumés written in the Timeline format have a column on the left side containing the time frame for each each item in the résumé. This format is recommended for people who have less content to included on their résumé or applicants who can make use of short bullet points effectively. The white space in the left column makes the résumé less daunting to readers, and Timeline résumés are also generally easy to read because of the clear progression of the applicant’s professional development from the beginning of their education to the present day. 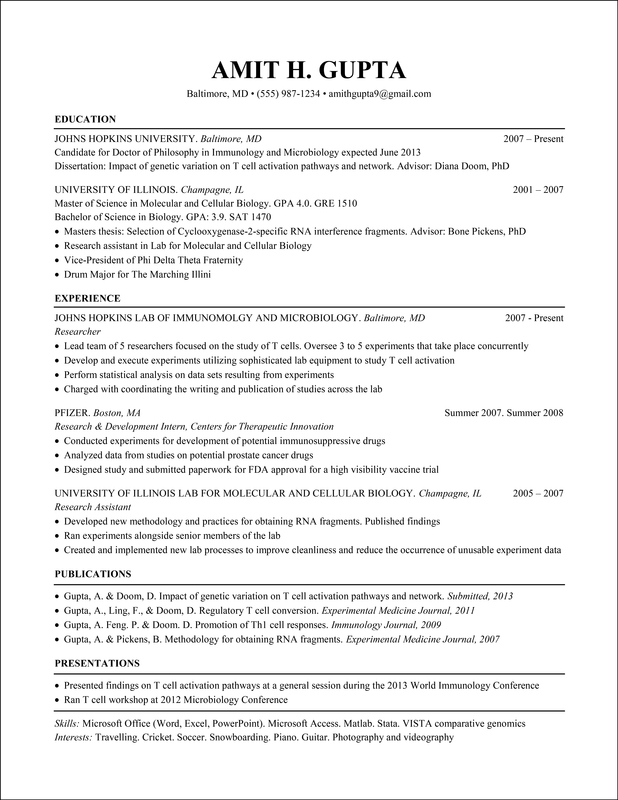 The following is a template for reference in creating a résumé with the Timeline format: Timeline Résumé Template. Résumés written in the Regular format look more like conventional résumés. Instead of showing experience and education in chronological order, the time frame over which experiences and education occur are shown on the far right of the résumé next to each item. The advantage of using this format is that you can fit more information onto the page. The disadvantage is that it is easier for your résumé to seem cluttered and difficult to read. If you have ample relevant experience and need the space, use the Regular format and make sure to leave enough white space and stick to the standard 1” margins. Click here for a template for writing a résumé with the Regular format: Regular Resume Template. The first thing a reader should see is your name, centered at the top of the page in 24-36 point font. Depending on which font you choose, you might want your name in bold, and/or capitalized. Centered below your name, include your contact information in 12-point font. Since your mailing address is likely not relevant, instead include your phone number, email address, current city, and any social media links if you have a strong online presence. Contact information can be separated with a period, vertical line, or a bullet point. Most recent graduates open their résumé with a brief Education section. Here, you should include the name of your university, your date of graduation, and your degree. Follow similar formatting as the example below. This candidate includes academic honors in his Education section, but you may also have an Honors section if you have enough accomplishments. The bulk of your résumé should consist of your relevant experience. This section may be divided into several categories: for example, if you are applying for a job as a science teacher, “Pedagogical Experience,” may be one category, and then you may have another section, “Research Experience,” to highlight your academic background in the sciences. Will a reader be able to infer something about my professional potential from this experience? Did I have enough of an impact to write at least two bullet points of description about my responsibilities? Did I stay in this position for at least a year? What will I lose by excluding this experience? What can a reader learn about me and my potential if I include it? While your experiences should take priority, you should also consider including additional sections if you feel they will work to your advantage. Do not include a language section unless you are proficient in multiple languages. Those two semesters of high school Spanish are not worth mentioning, but if you are applying to a job in global communications, you absolutely should include a section about your language proficiencies. Many employers will value candidates who speak multiple languages fluently, so if you are bilingual you should absolutely include your second language. All employers will assume that you have an advanced knowledge of basic software, such as Microsoft Office. Only include special skills if you have mastered programs or technologies that will be useful in your field. Some candidates try to add character to their resume by including a brief hobby section. But be prepared: if you list “telling jokes” as a hobby, have a joke ready for your interview! For recent graduates, a hobby section can give a reader a more personal idea of your interests, but remember to be brief and only include this section if you have space. Having little work experience, Amit does well to emphasize his impressive academic achievements, research experiences, publications, and presentations at prestigious conferences. Using technical language is acceptable and recommended when applying for jobs calling for PhDs. While the reviewer may not necessarily understand your entire research project, using action-oriented technical language will seem impressive to the reader. The Publications section is a great addition to Amit's résumé since he has contributed to several published papers for renowned journals in his field. It would have been helpful for him to have also included reference numbers and the number of citations for each publication. By paying close attention to detail, and ensuring that your résumé demonstrates your aptitude and accomplishments, you will have an advantage over candidates with less professional presentation. Once you have a rough draft of your résumé, you can begin editing the content to make sure that your descriptions are dynamic and that they highlight your achievements and impact. A well-organized, streamlined résumé is instrumental in advancing in your field. By following these tips, you will have a professional résumé that demonstrates that you are a perfect fit for your dream job.